This Christmas, I'm trying to do most of my Christmas shopping with independent businesses. After my mum started her Etsy shop The Hippy Rose in 2015, I realised just how important it is to shop small. Every time someone favourites a listing, follows us on Instagram or even better, makes a purchase, my mum does a little happy dance. Small businesses are more often than not, people trying to achieve their dreams, so if I can make a dozen or so happy dances happen over the Christmas period, I think I'm doing it right. That is one of the points of Christmas after all, isn't it? Spreading joy and festive cheer? So in my efforts to shop small this Christmas, I thought I would share some of my favourite picks I've found on Etsy and beyond. Each item in this Christmas gift guide is £20 or less, so there's plenty of stocking fillers and small but thoughtful gifts for you to add to your basket. From prints to pins, I'm sure in this post you'll find something you can buy to spread some joy. Not just to the person who gets it on Christmas morning, but to the seller who works so hard to make these things and, hey, even to yourself for doing a good thing. Jewellery is always a fool proof gift when it comes to Christmas shopping. Whether it's small and sweet like these star hoop earrings which will appeal to just about everyone, or something more bold for someone with a wilder sense of style. Another thing I love to buy from small businesses is pins. There are thousands to choose from, but you can go super personal with niche gifts like these Wizard of Oz or dungaree appreciation society pins for your favourite dungaree fan. 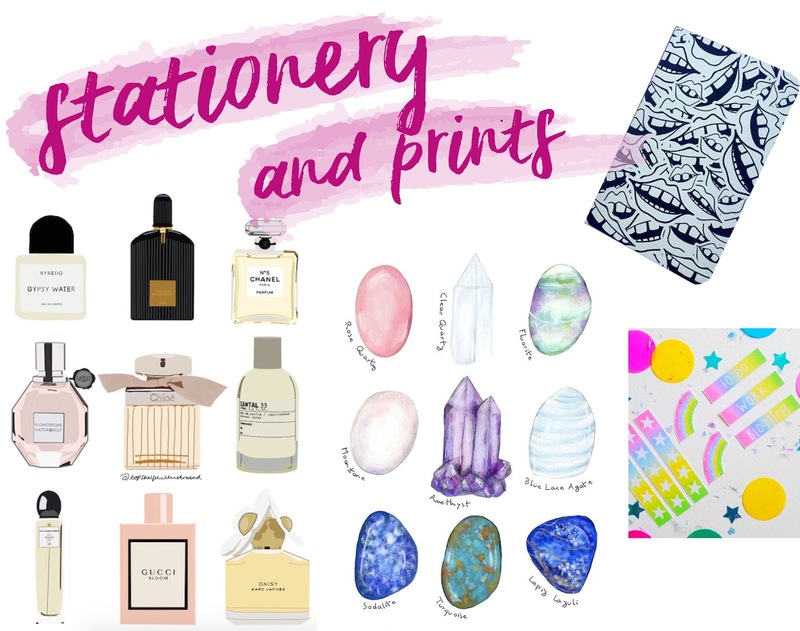 If you're anything like me, you'll be partial to a bit of art and stationery. I mean, who doesn't like those things? That's why they always end up on my Christmas shopping list each and every year. This perfume print is illustrated by my lovely friend Lauren and would make the perfect gift for any beauty lover (maybe even a beauty blogger?) in your life. The crystal print would be the perfect gift for the crystal lover, too. We all know one, and why not treat them to this pretty illustration to keep next to their collection? For the stationery lovers, I've found this quirky lip print notebook, which is actually part of a collection, so make sure to check out Jaqueline's other listings for more options. And finally, we have blogger favourite Dorkface's planner stickers, which make the perfect stocking filler for your most organised friend. 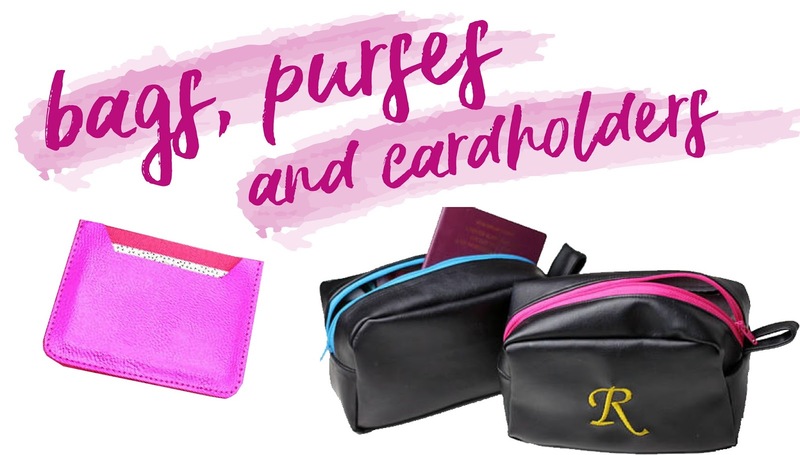 Another classic present is a small bag or purse which your loved one can use everyday, or as a makeup bag or travel pouch. So, know someone who commutes to work, loves makeup or is always off on their travels? This metallic pink cardholder or custom name pouch (made by my lovely mum) would be a perfect, personal gift. And there you have it. Some of my favourite picks from a bunch of small businesses for you to support when you're doing your Christmas shopping. If you buy anything, or even something else from one of these sellers, share the love! Let me know in the comments or over on Twitter. 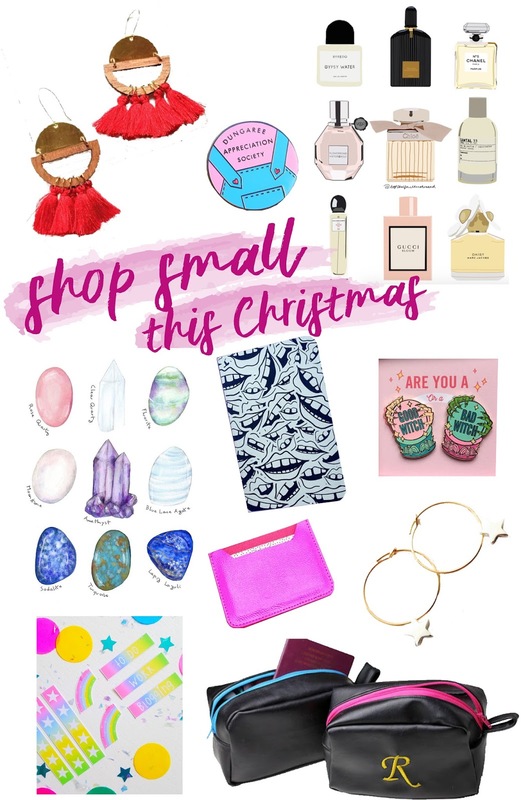 I'd LOVE to see if this post convinces at least one of you to shop small this Christmas. Also, a few of the items from my 2016 Merseyside Etsy Team gift guide are still available, so make sure to check that out too! Love doing the local Christmas craft fairs, have bought some amazing hand made silver earrings and some lovely bath bombs.